If you are in the market for a new outfit, be it for work, a wedding or (if you are an optimist) the summer, then by jove you’re in luck. There are some good fashion deals and discounts out there at the moment, from supermarket fashion all the way up to the high end stuff. Here are five that have caught my eye this week. The discounts range from 20% to 25%, so there are some savings to be made – and some pretty dresses to be had. The Phase Eight deals are always popular when I post them here – partly, I think, because everyone is stocking up on pretty dresses for the coming wedding season! Anyway, right now you can get 20% off anything and everything on the Phase Eight website. No code needed – just click through. Expiry date unknown. This one is pretty much what it says on the tin: go to this section of the Oasis website, to get 20% off selected dresses. There are 170 dresses from which to choose, ranging from wedding guest outfits to smartypants workwear. 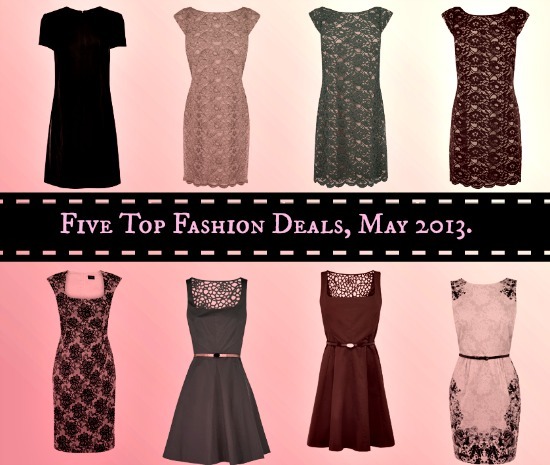 The dresses in the picture above are all discounted Oasis dresses. At the checkout, enter the code 20MAYDRESS. Expiry date unknown. One for the label mavens! The actual deal is £30 off orders off £150 or more, when you shop at the Liberty website – but let’s face it, if you’re shopping for clothes at Liberty, you’ll be spending more than that. Also, this deal covers everything on the website, not just fashion. At the checkout, enter the code SPRING13. This deal expires 21 May 2013. Save 24% on full-price items at Dorothy Perkins. No code needed – just click through here to the DP website. This deal expires today though (Wednesday 22 May 2013), so you’ll have to be quick. I’ve written before now about how I rate the TU clothing range at Sainsburys, particularly the baby clothes. Every now and then they discount everything in-store by 25% – and the latest discount has just rolled around. There is 25% off everything TU from now until Monday 27 May 2013. You can find your nearest TU stockist here. The Liberty deal expired yesterday? Damn! Ooh, Phase Eight. How I love it – one of my fave wear-anywhere dresses is from there. I sense danger ahead! Thanks for the terrific tips, Miss Thrifty. You are quite the temptress! This will sound like a strange question but when it comes to being thrifty say in a department store, do we as consumers have any ability to haggle over a price? I’m talking a full on store big chain store with set price tags. I only ask because one of my girlfriends I was with the other day talked a woman at the counter down £10 on a dress. I completely expected the clerk to say no but after a moment, she agreed and rung it up. Apparently, a lot of people will just come out and ask someone in a store like my example above, if they can do any better on the price? Is this common at all? Talking down prices at big retail stores? Answer: yes, definitely! The only thing standing in the way is your traditional British reserve / prudishness. Last year a study (by MoneySavingExpert, I think) showed that in some big chain stores, you can successfully haggle up to 80% of the time. The top ones for haggling were electrical stores rather than fashion chains, though. This is amazing – thanks Miss Thrifty! Further to these fab discounts that you’ve posted, it’s now also the summer sale season – my favourite time of the year. I needed to get a new dress for a work party and found a steal at French Connection – a dress that was £135 marked down to £40! I find some sales to be a little “jumble sale-esque” but if you stay vigilant and time it right (visit the stores after work, rather than during peak times at the weekend) then I find you can pin down a perfect party piece for a fraction of the original price.